There are two teams which have grown out of my initial idea for a single MVP, and the Judwan are the first to be released. 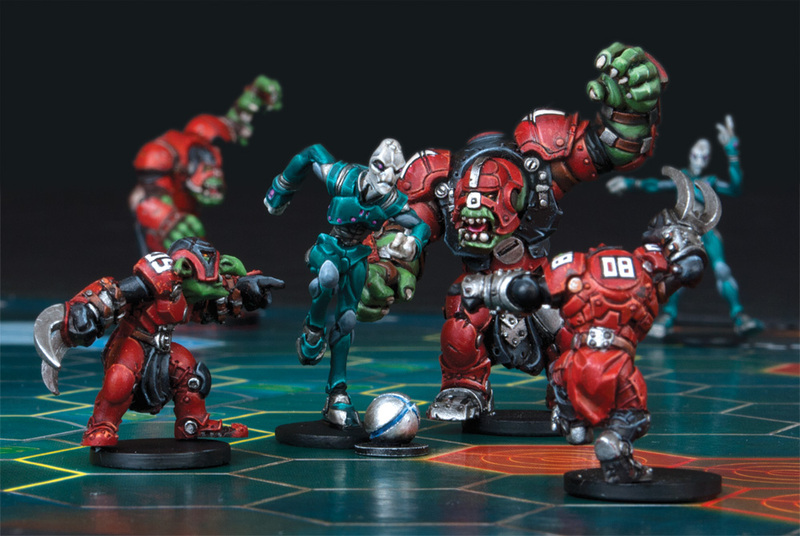 From day one they’ve been an experiment in the extreme end of what’s possible for DreadBall teams – because they have nothing but Strikers. Now obviously if a team only does one thing it’s going to have to be pretty good at that, but simply upping their stats didn’t seem very interesting to me. 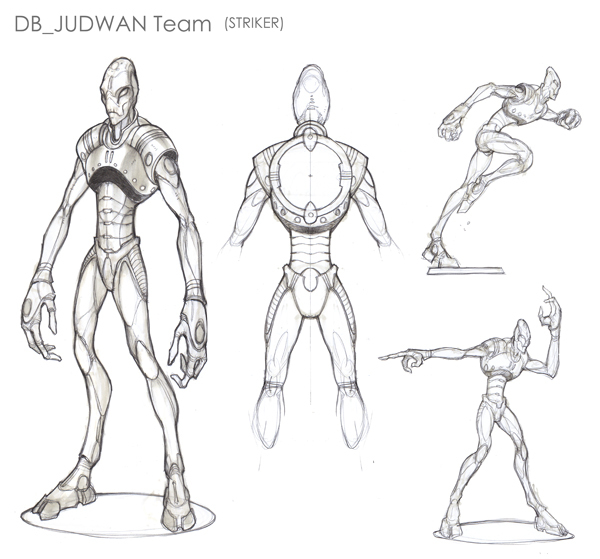 Instead the Judwan have accumulated a number of unique abilities that define them in game terms. Firstly, they are Pacifists. That means no deliberately harming opponents. Now that’s reasonably easy to avoid when you can’t Slam, but it also means you can’t Throw the ball at them either. 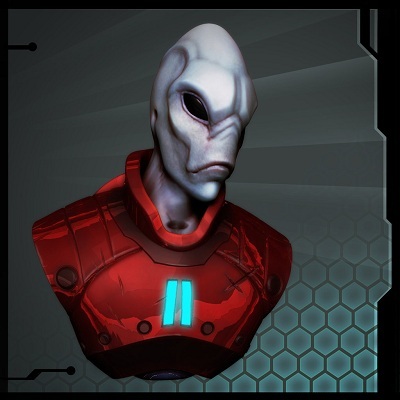 As well as having an unusual mental outlook, the Judwan are also physically different from most players, and don’t actually use a DreadBall glove (thanks to special dispensation from the DGB). Instead they are so skilled that they can Throw and catch the ball with their bare hands, a feat which would usually remove a finger or three. This actually means that they can Throw the ball further than normal because the inbuilt limiters of the DreadBall gloves aren’t present, and the reflex training of the Judwan’s art of Mu’shen’wan allows them to position themselves more accurately than other players. In game terms, this means that their range bands are 4 hexes long rather than 3. To balance this, they cannot score bonus points. During playtesting, the Judwan worked well enough from the start in terms of scoring and winning matches. Despite this, they just weren’t enough fun. Playing with and against them was simply not engaging enough. Eventually people also worked out ways to block them into corners from which they couldn’t escape because they had no Slams and no ability to move their opponents about or break holes in lines. I toyed briefly with giving them all Jump, but even that didn’t quite fix the issues of positional play, nor did it make them much more fun to play. I was repeatedly asked to give them the ability to Slam, but I resisted. Adding Slam to a Striker breaks one of the core principles of DreadBall and would have opened the gates for fudging the whole clean system that differentiates between the player roles. It was tempting to use it to fix this one problem, but it would have broken the balance and clarity of the whole design, so I said no. Instead, I came up with a new ability called Misdirect which was another manifestation of their art of Mu’shen’wan. This means that it fitted perfectly with their background and Pacifist stance, whilst also giving them the ability to move opposing players about. It incidentally made them much more interesting to play and gave them a whole new set of options on the pitch. This is the version you’ll see in Season 2. On the pitch they do take a big mental shift to deal with as they simply cannot remove their opponents. Instead you play a game of DreadBall almost as if your opponent isn’t there. As with all the Season 2 teams they make both sides think a bit differently and perhaps a little harder, thus raising the whole game to the next level. I hope you like them. Been really looking forward to hearing more about the Judwan. No bonus points? That’s interesting. Will other strikers be able to gain the misdirect ability? What’s their stat line like? I Jud Wanna know more! Any chance will get a peak at Coach rules next? Both Strikers and Jacks can get Misdirect. Coaches and Cheerleaders coming in the next day or two. Great to have some concrete judwan info at last! I cant wait to try these guys out. Nerve wracking for both sides Id guess. Limiting scoring to 1s and 3s is interesting. Can judwan score from the bonus hexes (at reduced score) or are the bonus hexes totally redundant to them? Judwan can score from the bonus hexes, they just don’t get a bonus point. Is there any fluff reason for that? It’s a compromise between the DGB and the other teams. If the Judwan are allowed to play without gloves (and so get a benefit) then they other teams won’t stand for it, and rightly so. It’s blatant favouritism. The lack of bonus points is the balancing factor they agreed on to allow Judwan to compete on more even terms. It looks like the Judwan and the Veer-Myn have a lot in common. Would you elaborate on the differences between the two teams and also why someone would play one over the other? There is a world of difference between having not much ability to Slam and having none at all. That’s one thing. Misdirect is great for moving people about, but is not the same as taking them off the pitch. The Veer-myn are also poorer Strikers in a Skill sense, so have to make more attempts to get the points. It’s hard to describe without putting you in charge of a team, but you need to think quite differently with the Judwan. Of course, some people will pick one or other because they prefer the fluff or the models. I am in the same camp I already broke my vow not get any S02 teams till I painted S01 so keep out of my mind! Is misdirect an opposed speed test, or a Slam variant (with dodge or slam back)? Sort of both. You get to Slamback or Dodge against it, so if you choose to Dodge then it’s Speed vs Speed. Do the usual restrictions apply? Can you only dodge if I feint behind your back? Yes. Slamback for a Jack or Guard with the feinting player in their Threat Hexes. Otherwise it’s a Dodge. Compared to Marauders they are completely different. That should be an interesting change of mental gears for you. Any chance we can know their speed and skill stats? Soooooo, gonna try these guys out this week! Hmm, I think they’ll be easier to play than the Veer-myn. With the VM you needed your guards to move players around to get the ball, with the Judwan any player can move other players around, reducing the dependency on guards. They’ll be as survivable as the VM and score more easily. Jake have you thought of a post to collect peoples dreadball house rules? I’ve encountered some interesting ones so far, though so far limit myself to fixing the bounce scatter to a fixed 1-6 (an arrow by the side of the board pointing towards one end of the field saying ‘1’) and fixing the throw in scatter so 1-3 and 4-6 don’t alternate (again done with the same arrow on the field) in the same way that custom blood bowl pitches have the 1-8 scatter fixed with a template printed onto the board. The scatter isn’t a problem, but the launch one is. There are only 5 hexes the ball launches along but a d6 is used to determine it, which skews the position of the ball. ie a 3 is the the centre of the field and 4-6 is on one side of the field, so the ball is more likely to end up on the far side of the launch line than the near side. If this is always a set direction it means the ball will concentrate on the same side for both teams, rather than opposite sides. This depends on how you read it. one idea we played with was when the ball enters play 1-5 is normal, but if a 6 is rolled the ball hasn’t launched and launches next turn, this means you have the odd turn with no ball in play and a fight on your hands, at first you think this gives the opposition who just scored a bonus but in effect it allows you to get some strikers on the the line ready to catch the ball when it enters play. its really added some flare to games. That sounds fun. I’ve scheduled a post for today to act as a collecting point for DB house rules, as Chris suggested. It’d be great if you reposted your idea there. It’ll be up in half an hour or so. You can’t block the scoring hex?? You can stop the 2x scoring hex but no matter where you place a defence you can still have a shot on the strike hex and seen as the judwan don’t have to decide whether the try and go for big points and have to move to blocker means that this defence is not going to help you against judwan. where does it state that in the rules, as the player is blocking the line of fire for a throw in effect. Try page 50, second paragraph down on the left. ok page 50 has no relevance in my rule book !!! on page 38 it states on the 3rd paragraph in the throw section that its regardless if its a strike hex or a player, if a another player is on the line then its a blocked shot. on the second paragraph it says you can still shoot for the strike hex is another player is standing on the strike hex. Im m ore than happy to be wrong. The key is you can score by throwing through non scoring hexs to reach the srtike hex so long as you throw from the scoring hex as the only scoring hex to have 1 possible shortest route is the 2 or 4 pointer you can only block that with 1 other player. Made the same mistake as well. I am now firmly convinced that THE JUDWAN ARE “BROKEN”. I am also able to describe precisely why. Because of the skill “Misdirect” (allowing the player to take the “Feint” Action), Judwan behave as both Strikers and pseudo-Guards. This violates the most important design constraint of the game (role types). So, unlike other teams, you always have a Judwan or two to hand for whatever you want to do. 3 or 4 of them on the pitch seems ample most of the time. As if that were not enough, the stats and skills of the Judwan are optimised for their roles as both Strikers and pseudo-Guards (they are better at both than any other player in the game can be, even with development). Lastly, the team is resilient, and killing them does not seem to be a viable option. With Speed of 3+, a defensive coach, and plenty of “free” dice from Fan Checks, they are the most resilient of Strikers. My guess is that the Judwan are simply a case of botched last minute design. Jake had boxed himself into a corner with his commitment to deliver a pacifist team. Playtesting will have shown that they could easily be defeated by static defense (limiting the Judwan to 1-point Strikes, as they could not move opponents from blocking positions on Strike zones). Hence the skill “Misdirect” was invented at a late stage, and (I suggest) without proper playtesting. The rule restricting Judwan to 3- and 1-point Strikes also looks to me like a last minute addition, as late stage playtesting will have shown the new Judwan to be “a bit good”. The rule does not compensate for their goodness, it just delays their victory. I’ve seen dead Judwan before, and with no spare players and the cost of getting new ones every casualty hurts. Are they good? Yes they are, and they pay for the privilege. Can they be beaten? Yes they can. Why are they harder to hurt than Veer-myn Strikers? They’re wriggly in their turn, but in yours they get smacked about just as much as the rats. They have the same Speed and the same armour. Playtesting did indeed show that they had to be able to move opponents out of the way. They were utterly unplayable without that ability and we tried a number of permutations. More were suggested and I chose the least violent of them. “Without proper playtesting” is simply not the case, nor was it true that the restriction in points was a late addition. That was around from the start as it is the corollary to being able to throw in bands of 4 instead of 3. Would I have preferred more testing? Ask any designer that question about any game and you’re likely to get the same answer. Whether they are balanced in the sense that they win half the games against a mix of equally skilled opponents I don’t think has been tested yet in the community as a whole. I don’t think the DB community is, as a whole, sufficiently mature in their skill sets across the board to really know that. If the Judwan prove unstoppable in tournaments then we’ll have to look at them again. For the moment the game is very young, it has changed since Season 2 and will change again with 3. Hard to make a final judgement till the dust has settled.